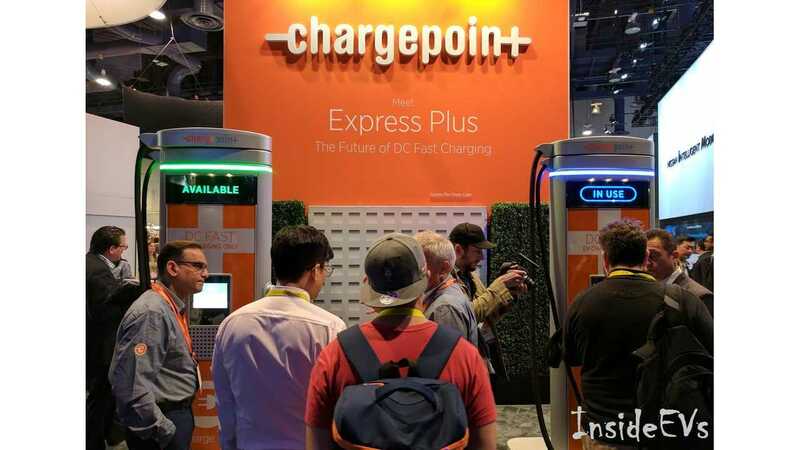 A few days ago while at CES, I posted the news here on InsideEVs about ChargePoint’s new Express Plus line of high power DC fast charge stations, providing up to 400 kW of output. As one would expect, there were a lot of questions asked in the comment stream. 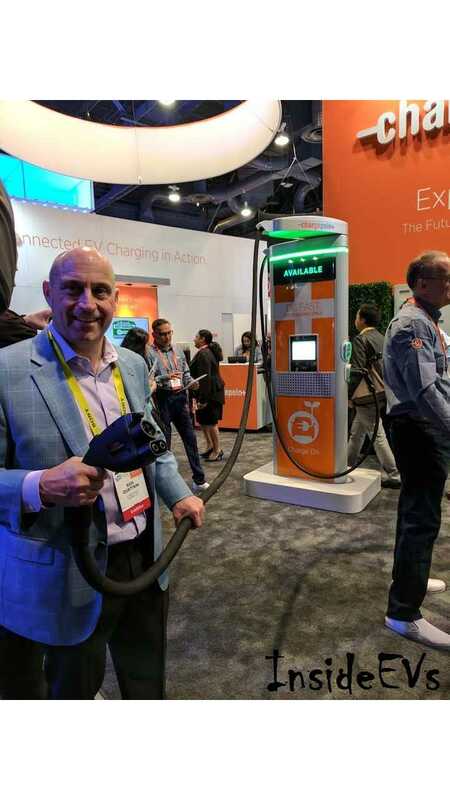 So I wrote down a few good ones, added a couple of my own, and headed off to the ChargePoint booth at CES (in Las Vegas) to get some answers. The ChargePoint folks were happy to accommodate. Simon Lonsdale, Vice President of Business Development, was gracious enough to sit down with me and be interviewed on the spot, without me having arranged the interview in advance. Before I go into the interview, I’ll share some observations I made after spending some time inspecting the stations on display. 1.) The cables are twelve feet long, which is pretty good for DC Fast charge stations. The top of the station where the cable connects swivels 180 degrees to add another foot or two if needed. 2.) The suitcase-sized modules simply slide in and out of the Power Cube. They literally plug in without the need of an electrician to rewire anything if one needs to be replaced. The Power Cube will function if one or multiple modules fail, just at a lower power until the modules are replaced. 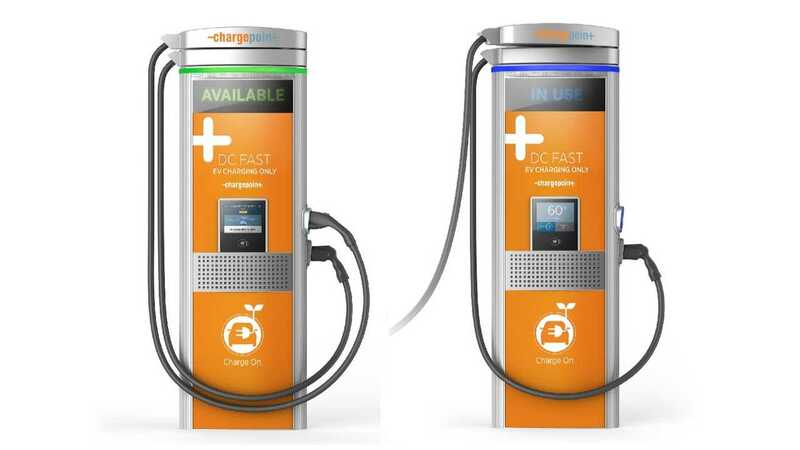 3) The ChargePoint Express stations are tall, at 7’4” in height. They are only 16” thick and 3’ 8” wide. 4) They have bright LED lights at the top of the stations that read “IN USE” or “AVAILABLE”. Because these lights are about six feet above ground level, they should be visible from far across a parking lot or a nearby street. 5) The “Cold Cable”, which is liquid cooled, is thick, but not as thick as I would have imagined it to be. Reps at the booth told me that they’ve tested it extensively in cold weather areas, and the antifreeze in the liquid keeps the cable from getting stiff and difficult to manage when it’s very cold. 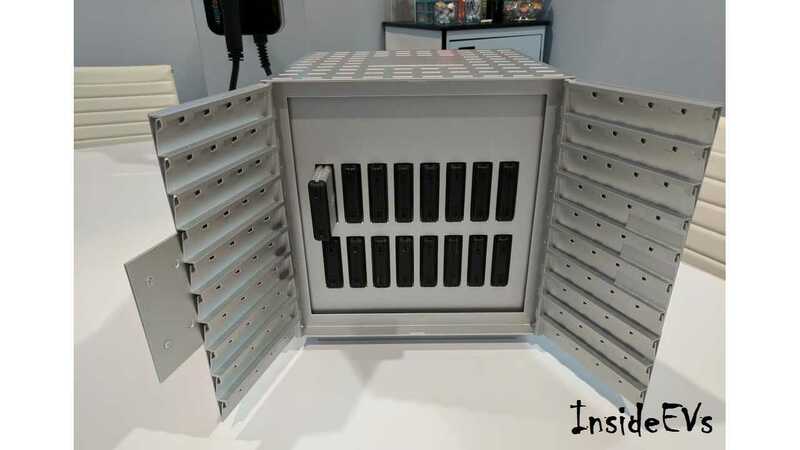 6) These stations can accept up to three cables. With CCS and CHAdeMO connectors a must, one has to wonder why engineer them for a third cable unless they believe it’s possible that they will add one. I can’t help but wonder if the third cable will one day have a Tesla connector at the end of it. ChargePoint wouldn’t comment on the possibility, but instead offered that they would be open to discussions with the manufacturer. With Tesla about to launch the high volume Model 3, and some Supercharger locations are already having issues with long lines, I for one hope the two companies figure out a way to make this work. How much will these stations cost? Also, given the difficulty we’ve encountered to date in installing a cohesive national network of DC Fast charge stations, won’t it be even harder to do so with more expensive units like these? “For our Express family, we’re not announcing pricing today, as you may have guessed. However we know what the market bears; we know what the 50kW station’s price point is. 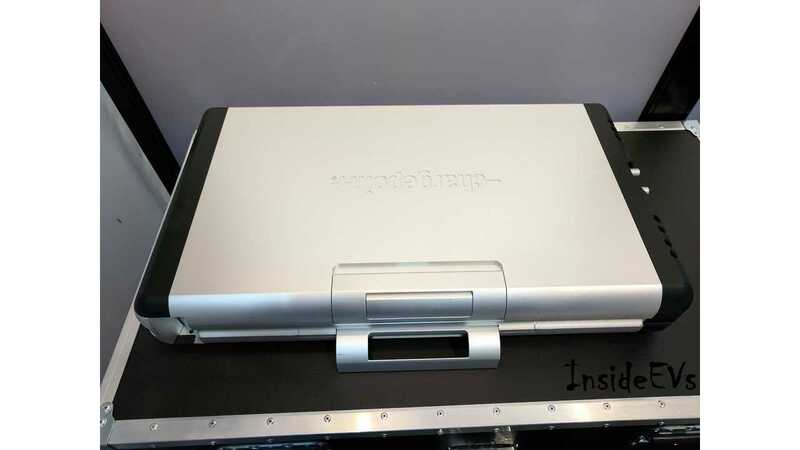 What’s interesting about the Express Plus that we’re not highlighting today because there’s so much to talk about is that you can obviously use it as a 62.5kW and there will be an option to software downgrade it to 50kW. So if you start from that point, that product will be price competitive in the market. Given all its future functionalities, it’s not going to be the lowest price, but it will be priced competitively. 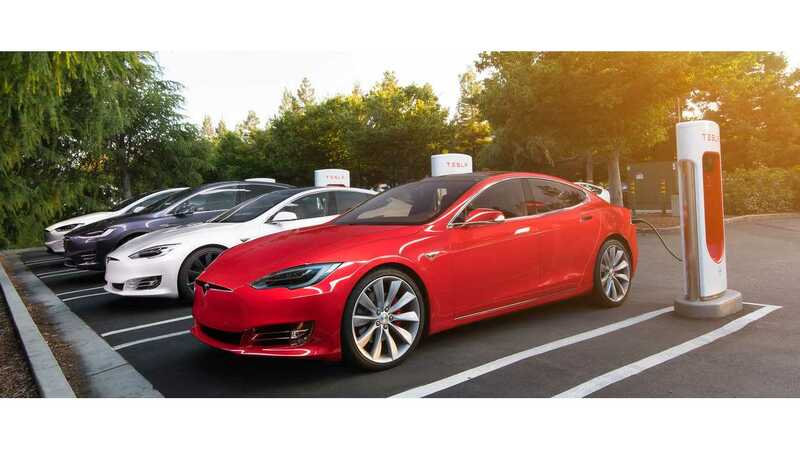 It will have a software-only upgrade option in price to 62.5kW; 25% more power, remote upgrade, just like Tesla does on their features. It’s kind of the way of the future. Then if you opt for the Express Plus family, where you have the liquid cooled cables, then there’s a little increment in price. However the great thing about this product is you’re just paying for the chargers today, and you know you’re future-proofed for at least the next ten years for as fast as cars can charge. You mentioned investment partners, does that mean ChargePoint may change their current business model and own and operate these stations as opposed to just selling the equipment and managing the network as you currently do? “I think, as everybody knows, where ChargePoint started is that our model is we have the best network, we design and develop our own products, and then we sell them out to businesses, retail parking operators and cities to operate them. Now, when we went into the home market, we had to modify that a little because we were selling to homeowners, but if you live in an apartment complex or condo you need a different model. So that’s why we modified our business model to fit into that segment. This fast charging segment is different as well, and though it’s available for businesses to buy, I think the main area is with special service providers that are set up to operate on a national scale. "I use the Supercharger network as a great example of how that’s helped to sell cars; that’s what’s needed with fast charging." What is the maximum amount of power these stations can deliver to any one vehicle at a time; car or even say a bus, assuming you have eight stations and a power cube on site? “The stations we have here today are limited, because of the cool cable, to a maximum of 400kW. The beauty is, as we look at the bus, truck and heavy industry, they’re actually migrating towards this common standard, but they keep thinking do we want more? Do we want 600kW, 700kW? Do we want a Megawatt into a bus? 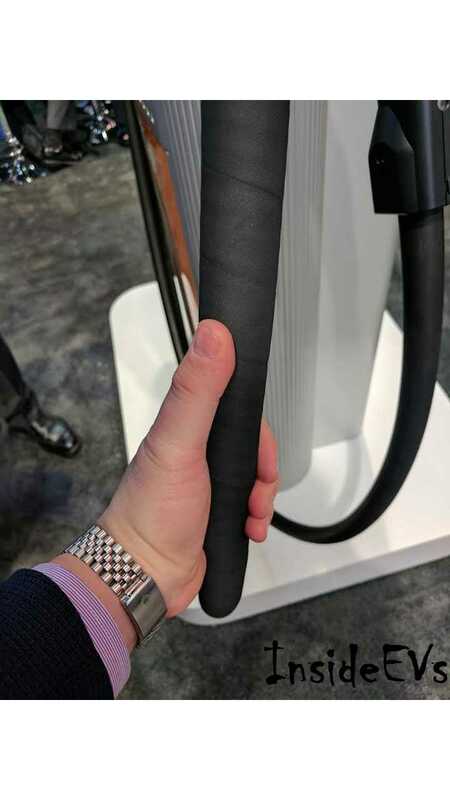 Is ChargePoint responsible for the design and manufacturing of the ChargePoint Express line, or are you using technology developed by another entity? “I’m going to separate the two parts out. So the design is entirely in-house. We’ve learned a lot from the first 400 fast charge stations that are on the ChargePoint network. They are actually from about six different manufacturers out there. 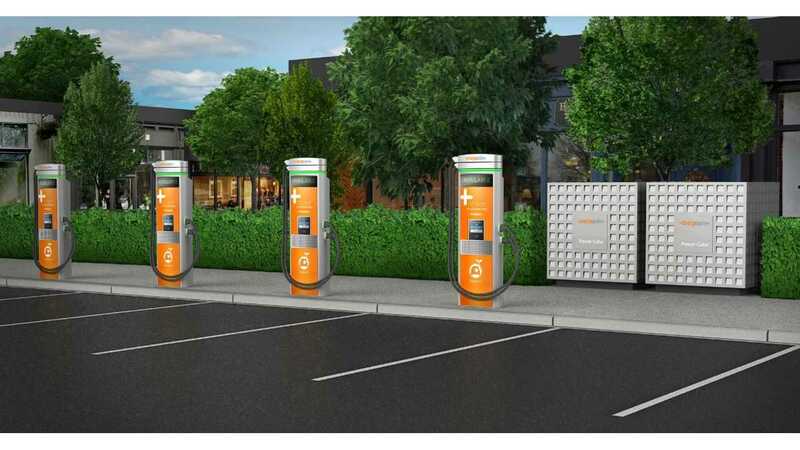 We had a hand in the design of a couple of them that we branded ChargePoint, the CP100 and CP200, but we’ve learned a lot, and we’ve taken that all in house to do a Greenfield, ground-up design of this project. Everything from the modules themselves is entirely ChargePoint intellectual property. The Power Cube, the charger, the connections to the network, all of it is our own. The cool cable is even an exclusive partnership with a cable company; you won’t find them on anyone else’s stations. Will you install Express Plus stations at the CEC Corridor DCFC grant sites? "Simple answer, yes. Wherever we can, we will be deploying the Express Plus family." 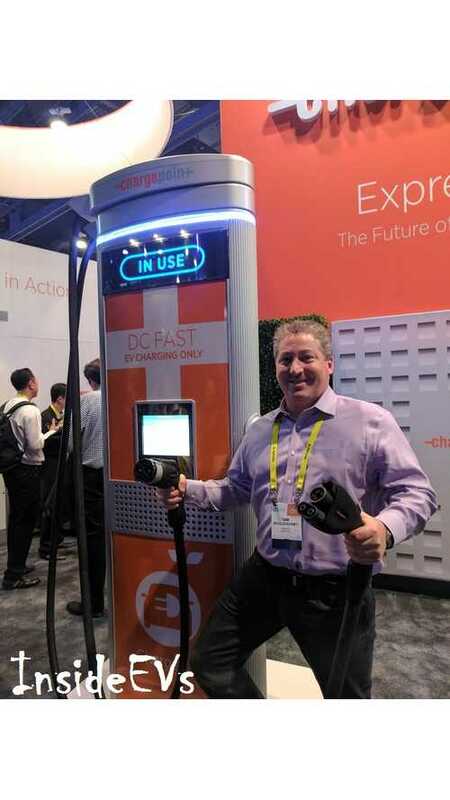 ChargePoints Senior Business Director Rich Quattrini looking for a DCFC/Combo equipped EV to charge up! How do the stations share the DC output across multiple stations? Every car needs a specific voltage that is different from vehicle to vehicle. This may be a little off topic, but there’s been a lot of talk about wireless charging systems lately, is ChargePoint going to develop a wireless charging system of their own? “People ask us that a lot. Think of us as a network; we have chargers for home, work, around town and out of town and as cars evolve and offer wireless charging capability, and especially autonomous parking to full autonomy, then wireless charging makes a lot of sense for at home and at work. One final point that I’d like to get across is not to get too caught up on 350kW or 400kW charging. Just because these stations are capable of delivering that kind of power, it’s not likely we’ll see cars that can accept the full amount for some time. Even the next generation of EVs coming out in 2018 & 2019 probably won’t be able to charge at more than 150kW, but that’s still three times faster than what cars, that aren’t made by Tesla, are charging at today. A rate of 150kW is still a huge step forward if the OEMs now spec their electric offerings to match the power that will soon be available. Charging at 150kW means you’ll likely reach 80% in a half hour or less, unless your battery is larger than 100kWh. 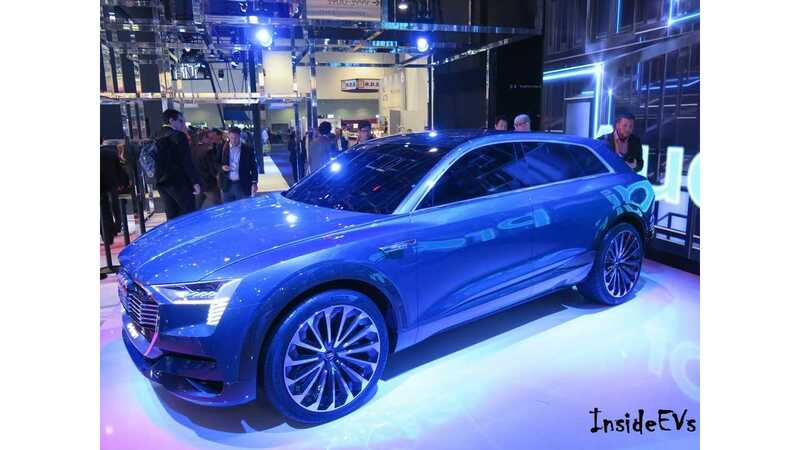 Audi (e-Tron Quattro) and Jaguar (i-Pace) have both promised 150kW DC charging in their 2018 models. These stations will be a huge step forward in public electric vehicle charging. They will go a long way in helping the advancement of EVs, especially if they are deployed with a cohesive national master plan. Lonsdale gave me the impression that he understands this, and is already working on just that. This may very well be one of the big pivot points that many electric vehicle enthusiasts have been waiting for.